This pizza base recipe will give you the perfect, tangy taste which has made artisan sourdough bread thrive in popularity over the last few years. It does take a lot of time to make sourdough, but the result is definitely worth it. If you then prepare it in a dedicated outdoor pizza oven, it produces an authentic homemade taste that can only be replicated in the very best of Italian restaurants. The best results can be achieved in as little as a few minutes with some of the new wood-fired pizza ovens we’ve recently featured. For all sourdough-based recipes, you will require a sourdough starter. This acts as a sort of yeast, which is the raising agent for any bread. You will need to make it about a week ahead of time, but once you have a batch, it can be used infinitely to make bread or pizza bases as long as you keep topping it up and checking on it regularly. It usually separates after a few days, so keep it mixed. To make your own sourdough starter, just mix 100g strong bread flour with 100ml filtered lukewarm water and leave uncovered overnight in a non-metallic bowl. Repeat every day for a week, stirring well, until the mixture is bubbly and airy. 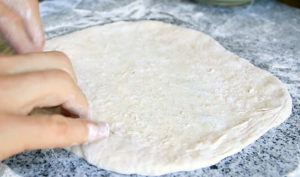 It is these properties which give sourdough its light texture, resulting in a crispier base and slightly raised crust. You can cover it loosely with clingfilm and store in the fridge until you next need it, or transfer to a suitable airtight jar. The mixture will never go off and can be topped up if you repeat the steps above at least once per month. You should always try to retain at least a quarter of your sourdough starter, so the texture and flavour isn’t lost. Feeding the starter will dilute the taste for about a day, but it will be ready to use thereafter. The following recipe will make roughly one 10” pizza base, so adjust accordingly. To make the pizza in your outdoor pizza oven, simply top with your chosen sauce and ingredients, and bake on an oven stone at the highest temperature. It should only take around 5 minutes for the pizza to cook. You can also bake in your kitchen oven at 200°C for around 10 minutes.